Review: An actress' identity blurs in "Madeline's Madeline"
The shedding of identity is a natural process for any actress, in order to take on the mask or manner of a character, human or otherwise. It's an act of appropriation as much as of creativity, and a truly gifted actress will leave one guessing as to where "she" ends and her role begins. 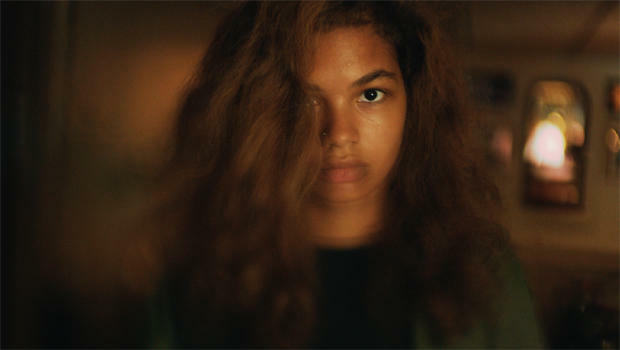 In "Madeline's Madeline," an invigorating new film from writer-director Josephine Decker, a young actress' very identity become grist for the machinations of an ambitious stage director, who sees nothing wrong with translating a cast member's very personal angst, shame or fear into a theatrical event. When a 16-year-old student, Madeline (Helena Howard), displays her considerable gifts in an experimental acting troupe's workshop, the group's director, Evangeline (Molly Parker), sees more than just a future Juilliard grad; she sees a vessel to appropriate and fill with her own creativity. Aspects of Madeline's life soon begin to define the character she portrays on stage. But who is she exactly? Madeline is a somewhat shy, somewhat sullen, and (we come to discover) a somewhat mentally-challenged young girl, scarred perhaps by a past "episode" involving her mother, Regina (Miranda July), and tempered by medication. The fact that Regina is herself an emotionally delicate and occasionally vituperative parent makes the relationship fraught with even more tension than is typical. And when Madeline reveals herself (or a representation of herself) to Evangeline as a victim and tormentor of her mom, it leads to what could be a psychotic break – or the most beautifully-rendered acting performance ever beheld. Or both! Decker's film (which premiered at this year's Sundance Film Festival) is improvisational, nimble, and fun in its artificial constructs, while making the characters' emotional boundaries eminently dangerous, like someone gingerly stepping onto a cracking ice floe. Miranda July (best known as the director and star of "Me and You and Everyone We Know") is terrific as a single mother who feels uneasy, protective and aloof around her biracial daughter, revealing her own insecurities as she tries to steady Madeline's adolescent imbalances. Molly Parker ("Deadwood," "House of Cards") is warm and cruel as Evangeline, the kind of leader whom soldiers will follow anywhere, until an irretrievable breaking point is reached. But the true standout is Howard, whose breakout performance this is. Her Madeline is scared and unafraid, proud and meek, bold and withdrawn, independent and immature. It will make you happily forget the cardboard figures standing in for teenage characters in many Hollywood films. A great gift is the cinematography by Ashley Connor (who also photographed "The Miseducation of Cameron Post"). Armed with a digital ARRI Amira camera, she uses unhindered movement, gauzy coloring and shifting focal planes to create imagery that feels internal to the thinking of the film's young protagonist. It's seductive and hostile, turning on a dime. "Madeline's Madeline" (distributed by Oscilloscope Laboratories) opens Friday in New York City, and in Los Angeles and other select cities beginning August 17. 94 mins. The film is not rated. To watch a trailer for "Madeline's Madeline" click on the video player below.